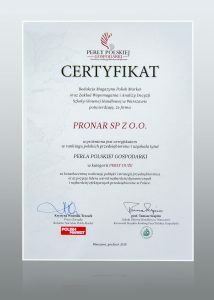 In the prestigious “Pearls of Polish Economy” organized by the “Polish Market” magazine, Pronar was awarded in the category of “Large Pearls”. The award was granted for the consistent implementation of the company’s policy and strategy and the leading position among the most dynamic and most effective enterprises in Poland. This unique distinction confirms the strong position of Pronar on domestic and international market and shows the potential dormant in 100%. The “Pearls of the Polish Economy” ranking is compiled on the basis of data of two thousand companies from all over Poland. The algorithm developed by scientists from the Warsaw School of Economics (which is one of the most prestigious universities in Poland) ranks companies using international auditing indicators. This year, honorary patronage over the “Pearl gala” was given by the Speaker of the Senate – Stanisław Karczewski, Deputy Prime Minister, Minister of Science and Higher Education – Jarosław Gowin, Minister of Investment and Development – Jerzy Kwieciński, Minister of Entrepreneurship and Technology – Jadwiga Emilewicz, Minister of Agriculture and Rural Development – Jan Ardanowski, Minister of Sport and Tourism – Witold Bańka, President of the Conference of Rectors of Academic Schools in Poland – prof. Jan Szmidt and the Polish Economic Society. This is another title of the “Pearl of the Polish Economy” received by Pronar. The company from Narew also received such award in 2017.